Right now, on Blacker Yarns site, they have some sampler packs of their wool. You can choose natural or dyed, dk, aran, etc. Like they say, this is like getting a mixed case of wine. You can try loads of different ones! I’ve been buying one off balls so this, to me, looks like a really great deal. I’ll be reviewing some yarns you might get in your bumper pack. This is not the actual colour. I had a filter on the photo. It’s a warm (browny) grey. 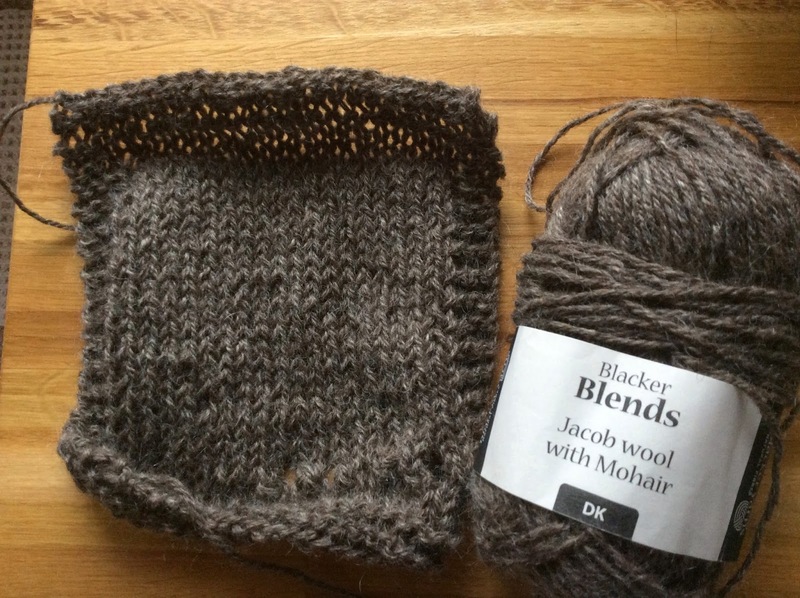 I’ve been surprised particularly by this Jacob/Mohair yarn by Blacker Yarns. It is rough in the ball. I wish I had better words for it, but it feels sort of solid. When you wash it, it comes out PLUSH. It’s just gorgeous. The stitches sort of hug each other and blur, and it gets about 100% softer. This I think is an effect of being woolen-spun. Don’t confuse this woolen spun with another Jacob 50/50 which is worsted spun. They are very different, but I’ll save that for another review. I know it’s not nice to pick favourites, but I can tell you that I really prefer the woolen spun in this case. I LOVE THIS WOOL. I attached a little unwashed baby swatch to add to the sample to remind me how different it was before washing. Gauge I got: 4″ = 16.5 sts x 21sts on 5mm. Ravelry listing here. Warning: there are entries for both the worsted and woolen spun under the one heading. 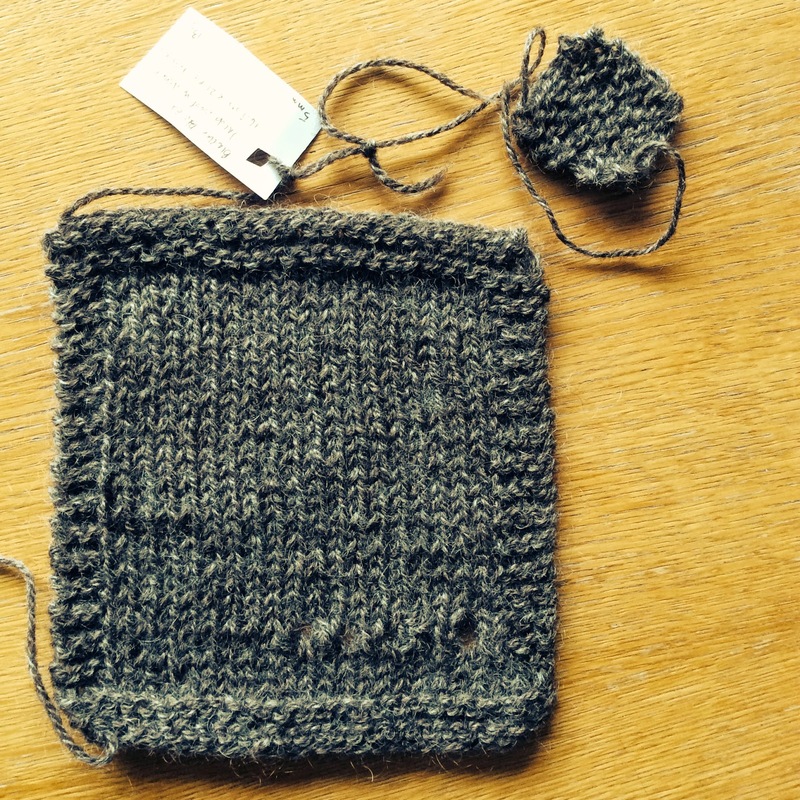 Knitting with it – What it feels like to work with it. It feels firm, and holds the stitches in place. It’s not very sticky, but the yarn glides around itself easily. I like knitting with it, I was surprised it seems thicker than most DKs, that’s why I went up a needle size. In the skein – What it looks like, or feels like. It feels more solid than some of my other wools. The yarn itself doesn’t squish. It has some great body to it. No one would ever call this limp. I would say if you are prickle sensitive you would touch this, squeeze it, and completely dismiss it. You’d be missing out! In the swatch – Include needle details and final tension stitches/rows per 4″. I knit with a 5mm which is larger than the recommended. I found the fabric has a nice density at 5mm, but you could go smaller and get something more firm. Before blocking I counted 16 sts x 21sts over 4″. So it shortened in the rows a bit it looks like. The swatch had curled a bit when working with it. I washed with Eucalan, soaked for an hour and squeeze out the water in a towel. I didn’t pin it. It just stayed flat. Very well-behaved wool. This would be so nice to care for. Tasting notes – Non-fibre associations that come to mind when working with the yarn. I would say this is plush. It reminds me of cabins, and cozy fires. Plaid. I honestly think of plaid when I touch this. I also think that since it’s so easy to watch/block it would be great as something that was in heavy rotation and was worn often. The first thing that comes to mind is the obvious crew-neck jumper, it could make any jumper pattern, but small textured stitches would be sort of lost on this yarn. This would be a really nice mock-turtleneck with a zipper (search on Ravelry). I think the yarn could handle the weight of the zipper. LOL, I only learned it by thinking I could make a striped project with those two yarns and discovering they were QUITE different!